Frequently Asked Questions (FAQ) about Liturgy.com and how to use it. Let us know if you have other questions that you need answered. Contact liturgy@ocp.org, or 1-800-LITURGY (548-8749) if you need more information. Can I share my music outline with my ensemble? How do I login to liturgy.com? Will my Liturgy.com planners be available on the new site? How do I add songs to an outline? How do I create a custom template for a Mass setting or a specific celebration? How is the new Liturgy.com different from the old site? How can I access the full readings for a celebration? How does the Scratch Pad work? How do I access outlines from past celebrations? Are there song suggestions to help me fill out my outlines? Is there a place for me to make notes about a song in my outline? What can I expect in the Enrich section? What can I expect in the Explore section? Why am I not able to preview sheet music for all the songs? Can I send a digital copy of an outline to my ensemble? How can I add a song to an outline that doesn't appear in search or any of the listed resources? Why can't I find my custom song in search? Can other ministers at my church use the same account? How much does a subscription to Liturgy.com cost? What is my login for Liturgy.com? Is there a way to test out the site before purchasing a subscription? I accidentally deleted my outline. How do I get it back? How do I purchase choral or instrument arrangements for songs I've included in an outline? Your Liturgy.com and ocp.org logins have been merged. Pre-Existing Liturgy.com subscribers: You have been sent an email with the email address associated with your merged account. If you are having trouble logging in you may need to click forgot password and reset your password. New Subscribers to Liturgy.com: When you begin a subscription to Liturgy.com you will be asked to login or create an account. That account will be your login for both liturgy.com and ocp.org. If you have an existing ocp.org account that you would like to use, simply login using that email address and password when prompted. Digital Library Subscribers: Login using the email address and password you have been using for Liturgy.com. If you don’t remember your password, click on “forgot password” to reset your password. If resetting your password does not resolve your login issue, please contact customer service at liturgy@ocp.org. We are standing by to assist you. If you have existing liturgy.com planners the past 6 years of your planner history has been migrated over to your new account. The term of your current Liturgy.com subscription has not changed. If you have an existing bill-to account, that process will remain the same. You will also be able to renew your subscription on your My Account page using a credit card or payment profile you’ve saved for your ocp.org/liturgy.com shared account. View details on the Manage My Subscription page. The new Liturgy.com has been streamlined for music planning. 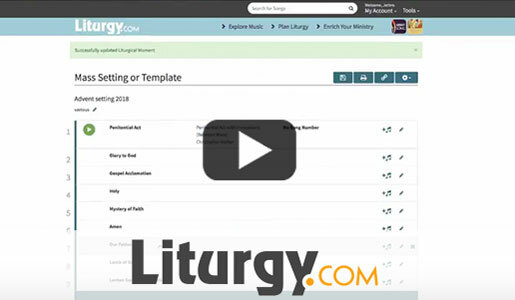 Comprehensive customer testing identified the most used features from Liturgy.com. Those features continue to be available but reorganized in a way that makes them more accessible and user friendly. In addition, new features such as Scratch Pad were created to better serve your needs. 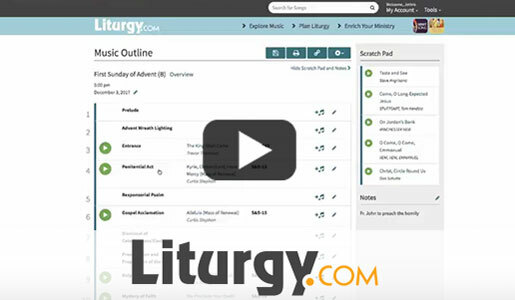 In order to provide more robust music planning features for your liturgy preparation, some seldom used features, as identified in the customer testing (homily suggestions, Scripture commentaries and prayers) are no longer available. On the Plan Liturgy landing page, each celebration has an Overview link. You can also click on the Overview link from the top of any Outline. The Overview page offers a summary of the celebration along with reading synopses and Prayers of the Faithful. At the bottom of the page, clicking on the View Full Readings button will take you to usccb.org, the official United States Conference of Catholic Bishops website where you can review the readings in their entirety. When finished, closing the newly opened window will take you back to the Overview page. Think of Scratch Pad like a digital notebook where you can jot down song ideas for a certain liturgy or season. There are several ways you can add songs to your Scratch Pad (search, my repertoire, suggested songs, etc.). There are different Scratch Pads for every liturgical season. You can access all of them through the dropdown menu at the top of the site. Watch the tutorial video about adding songs to outlines for a brief how-to. 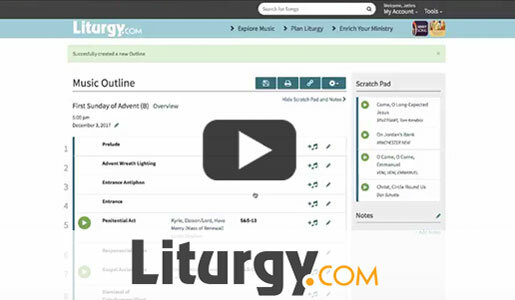 Go to the planning landing page by clicking Plan Liturgy from the top navigation. From the buttons at the top of the page, select the year and season you'd like to view. If the celebration was not a Sunday, select Special Liturgies. For past years, click on All Years and select the desired year. Note: Previous outlines are only saved from 2014 on. You can also access all previous outlines by date from the My Account dropdown through the My Outlines link. Song suggestions for each Liturgical Moment are drawn from Today's Liturgy and Liturgia y Canción. By default, this will display when you click the Add Song icon. In addition, there are lists of recommended seasonally appropriate songs from the seasonal overview page. The Explore section of the site also offers curated lists of song suggestions for various celebrations and occasions. Yes, when you are in an outline, you'll see a Notes field on the right-hand side of the screen. Anything you type in there will appear on the PDF or printed outline. With the Enrich section, you'll be able to simplify your job of choosing the right music for a specific celebration with insights from well-known liturgists, scholars and composers. There will be articles and commentaries on everything from weddings and funerals to multicultural parishes, working with choirs and more. In Explore music, you'll be able to discover new music suggestions and featured songs from OCP experts and music directors. Songs lists will include new and notable music, suggestions for upcoming seasons, ideas for choral music and so much more. If you have a Breaking Bread or Spirit & Song digital library subscription, you'll be to preview all the songs available in your subscription. Currently, a selection of the most used songs from the ocp.org catalog are also available for preview; that list will continue to grow as previews for the most popular songs are added. If a song you're currently looking for does not have a preview available on Liturgy.com, a preview may be available on ocp.org. Yes, you can save a PDF of an outline through the print feature. Click on the print button at the top of any outline. The next steps will be different depending on your browser. Find your browser from the list below. If you use Google Chrome: In the Destination section, click Change to select Save as PDF. Then click Save. A Save As screen will open in which you can rename the Outline and select a destination folder. Then click Save. If you use Safari: In the bottom left corner, click on the PDF dropdown menu and select Save as PDF. A Save As screen will open in which you can rename the Outline and select a destination folder. Then click Save. If you use Firefox: In the bottom left corner, click on the PDF dropdown menu and select Save as PDF. A Save As screen will open in which you can rename the Outline and select a destination folder. Then click Save. If you use Microsoft Edge (previously Internet Explorer): At the top of the print screen, select Printer, and then the option Microsoft Print to PDF. A Save As screen will open in which you can rename the Outline and select a destination folder. Then click Save. Once you have saved a PDF, you can attach it to an email and send it to your ensemble. 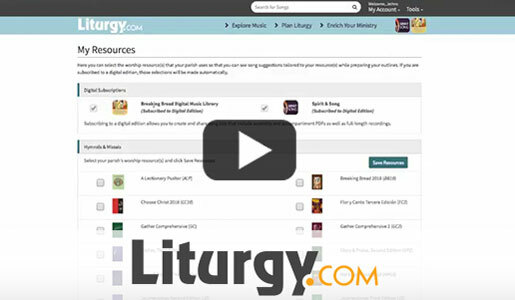 My Customs Songs allows you to add songs that aren't in the Liturgy.com catalog if, say, you composed a song for liturgy or you'd like to use a song from another publisher. Select My Custom Songs from the dropdown menu in the top navigation and follow the instructions on the page. Once you have added a custom song, you can add it to a Scratch Pad or an outline right away, but it may not appear in search results for up to 24 hours. Watch this tutorial video for a quick how-to. When creating a custom song, it appears immediately in your My Custom Songs list. From there, you can immediately add the song to your Scratch Pad for use in a celebration. However, it will take 24 hours for the newly added song to be imported into your search results. After that time, the song will appear in search results. An annual subscription to Liturgy.com costs $169. If you have a subscription to a Breaking Bread or Spirit & Song digital library, the music planner is included in the available features. Yes. You can find songs from a select number of third party hymnals and songbooks through the search feature; these songs can be added to any celebration outline. To see which third party resources are available, click here. Yes, more than one user can be associated with an account. Please call (1-800-548-8749) or email (liturgy@ocp.org) customer service in order to set up any new users. If you have a Breaking Bread or Spirit & Song digital music library subscription with multiple users, all of them will automatically have access to use the music planner. Note: all users on an account will be able to view all the activity of any other user on the account. Your initial login will be the email address and password associated with your ocp.org account. If you don’t have an existing ocp.org account, one will be created for you when you set up your free trial. Your login and password for both liturgy.com and ocp.org will be identical. Yes! New liturgy.com subscriptions start with a 30-day free trial. If you cancel your trial at any time during that 30-day period you will not be charged for a subscription. 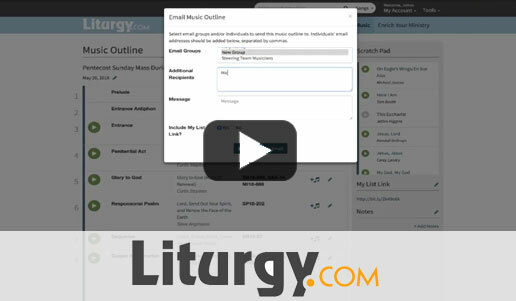 Go to the liturgy.com home page and click the Sign Up button for a 30-day free trial. Unfortunately, there is no way to recover deleted outlines. Choral and instrumental arrangements, if available for a song, can be purchased at ocp.org.